Montenegro or Crna Gora in Serbian. I have to confess that I didn’t know where the name comes from, I only know that it means ˝Black Mountain˝. I didn’t really see black mountains though. 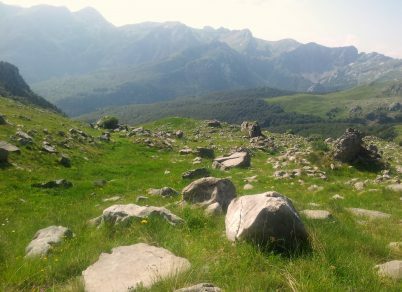 The mountains of Montenegro were green. Everything was green. Green valleys, green peaks, green forests, green fields… Green, green, green in all possible shades and shapes. 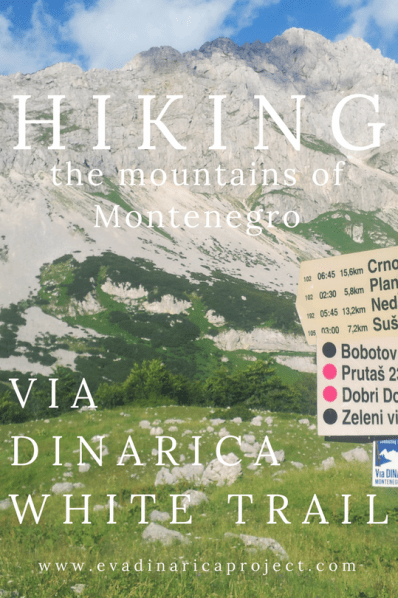 The Via Dinarica trail leads you from National Park to National Park, it connects one stunning piece of nature after another. Day after day I slept high up in the mountains. Just a few little towns along the way, but other than that, it’s mountains mountains mountains. Karst mountains. Mountains covered with white rocks and colorful flowers. Steep cliffs, sweet hills, impressive peaks and a lot of cattle. Sheep mostly. 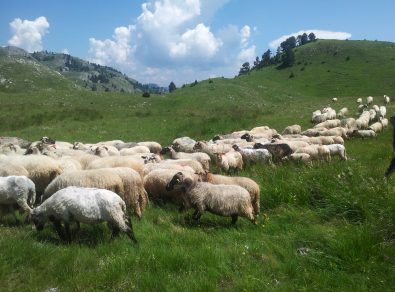 In the mountains of Montenegro I’ve seen more sheep than people. From Rikavačko Jezero I followed a makadam road to Katun Krivodoljski and went further up until I found a nice place to camp. 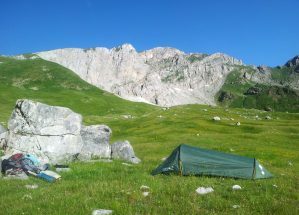 This was my first bivouac without any people, village or mountain-bar-kafe-restaurant nearby. The first night absolutely, completely on my own. I felt it, it did something, confused me. A strange mix of emotions. The beauty, the silence, the solitude. Tired, hungry and happy. Komovi got from that moment on, a special place in my heart. I became a fan. Komovi flew over into Bjelasica and Biogradska Gora National Park. It was quite some unpaved road hiking with here and there a real hiking path, but I enjoyed every step. The road gently curved along the mountains, a real treat for everybody who likes to look around during a hike. Wide vistas, spectacular views all day long. Until the descend to Mojkovac. In Mojkovac the Tara river begins, a phenomenal river that follows its way all into Bosnia and Herzegovina. I didn’t get to see much of it though, I went immediately up to Sinjajevina. This was the part I was a bit afraid of. ˝No water for over 70K and it’s really hard to find your way up there… No shelters, no facilities, no maps, no nothing!˝ Hmmm..
Family that offered me a dry place to sleep. Sinjajevina surprised me. Perhaps because I had low expectations and took all the precautions I could. I carried a lot of water and food, way-marked possible shelters I came across and carefully watched the clouds. In the end it all wasn’t as difficult or dangerous as I thought it would be. It was a pleasant surprise to be on this high ˝plateau˝ for a few days in a row. Even without stunning peaks or significant changes in altitude, for sure, Sinjajevina was intensely beautiful. Beautiful and wild in its own way. 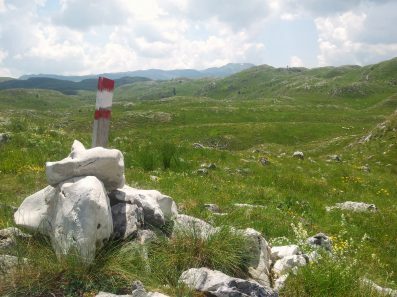 The trail itself mostly followed the Crna Gora Transversale, the CT-1. 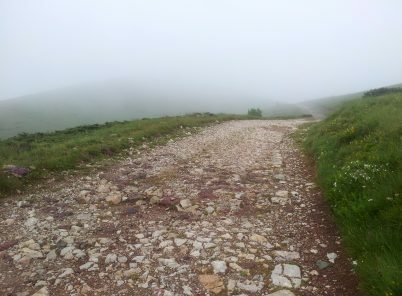 Not extremely demanding in terms of steep climbs or exposed ridges. Actually the terrain was mostly grassy, covered with stones and rocks. The CT-1 isn’t extremely popular (anymore/yet). This means there is no obvious hiked path and as far as the marks go, they are really hard to spot in the high grass. So yeah, thank you Garmin for keeping me on track. 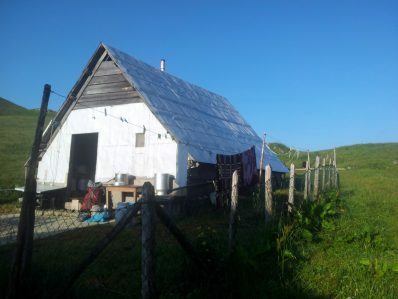 Between Sinjajevina and Durmitor there are some unavoidable road sections. Still I wouldn’t say that this is a bad part of the trail. It’s part of the deal when you’re hiking a long distance trail. You hike through a country, connecting the places, mountains, National Parks. You’re connecting the dots. It is inevitable that you cross some towns and some roads every now and then. They are to me just as much part of the deal, part of the trail. 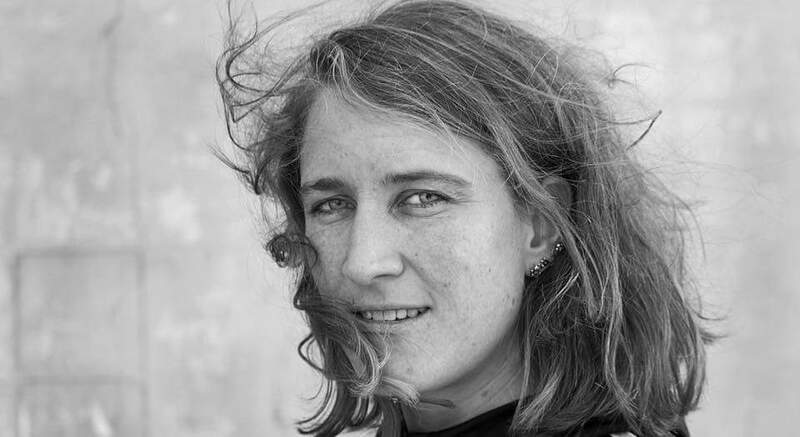 The trail as a story of a country in total. Arriving in Žabljak was a bit overwhelming. This little town is full of apartments, B&B’s and hotels. Restaurants, bars, cafes and shops. 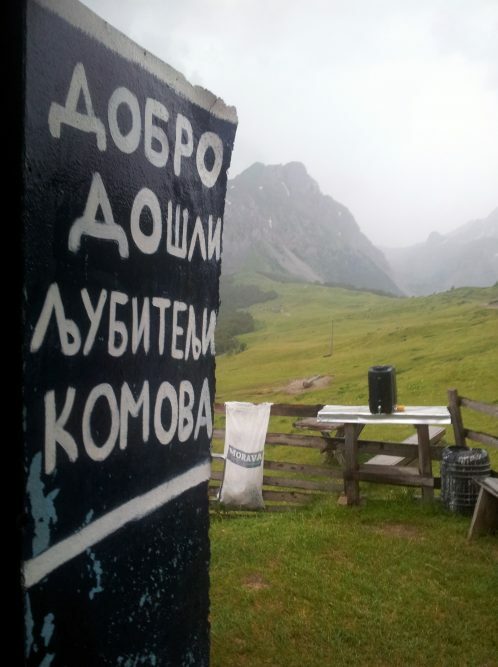 The tourist centers selling maps and on every corner there is an outdoor agency that sells tours. This National Park that is doing good business. 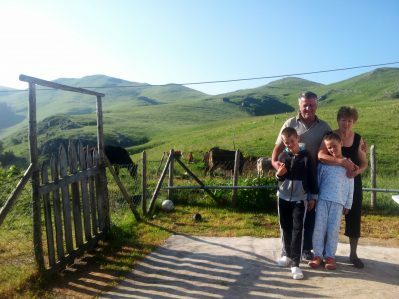 But still, once you’re up in the mountains, up in Durmitor, you hardly meet anyone else. And the good thing is, that there are accessible, well maintained hiking paths. 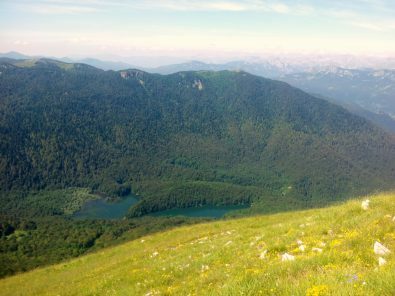 Luckily it is easy to escape the towny, touristy craziness by camping at Ivan Do, next to Crno Jezero at the foot of Durmitor NP. 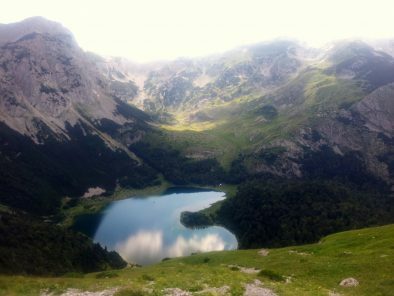 Once you’re there, you can see, smell and feel Durmitor. Wow wow wow. 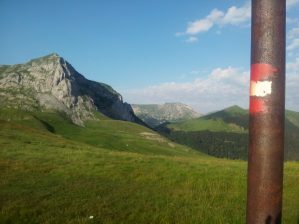 Durmitor really rocks! I prefer hiking in rocky terrain with a little bit of forest every now and then. I love ridges, traversing on a mountain or mountain range. Staying up high, exposed and open. The possibility to go to some peaks, but the guaranteed pleasure of hiking through a stunning scenery all day long. Who doesn’t want that? Again, nature was in control, the weather, the terrain, water sources, not knowing what to expect. During the day the temperatures could rise pretty high, but at night is was all of the sudden chilly. Clouds and thunderstorms told me when and how to move. I respected that, respected the mountains. Patiently waited out bad weather. Let the weather decide. 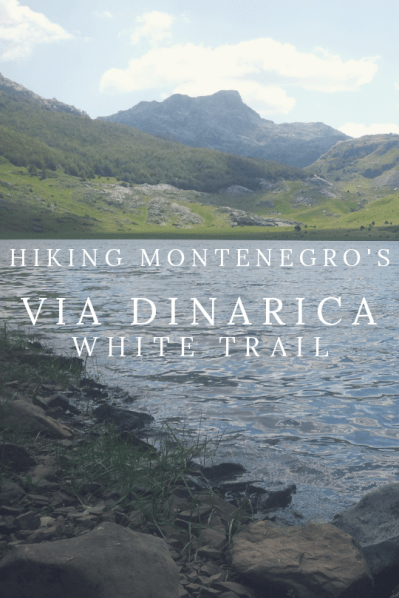 The last leg of the Via Dinarica trail in Montenegro followed the Sušica Canyon to Nedajno, led me through this so called Trnovački Durmitor and brought me to the famous heart shaped lake, Trnovačko Jezero. 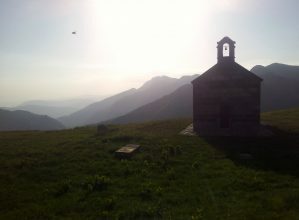 With the mountain Maglić on the border between Montenegro and Bosnia and Herzegovina, this was the last climb in Montenegro. With this climb, I managed to completely cross the second country on the Via Dinarica. 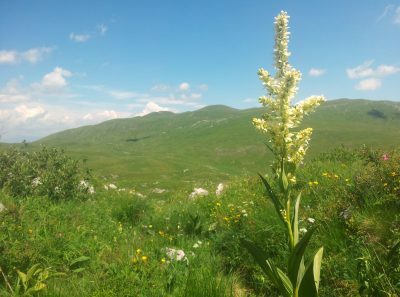 I connected the mountains of Montenegro from border to border. From lake to lake. Every mountain massif had its own story, its own character with its unique features and typical appearance. All beautiful. Spectacular, strong and powerful. Peaks, lakes, rocks. Canyons and high plateaus. Sharp lines, shapes and colors. Bright colors. Splendid vistas, majestic view. Rapidly changing weather, unpredictable nature. Diverse landscape and rural mountain life. 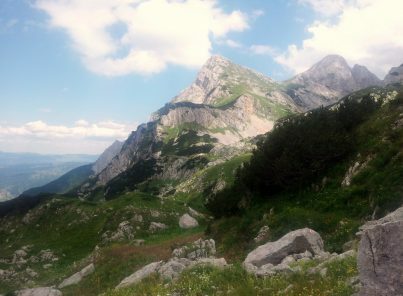 The mountains of Montenegro are absolutely magnificent! You can support me & my adventures on Patreon. Take a second to find out more here. Maglić, to climb or not to climb?